Is stem length critical to steering? I've been trying to decide between a new frame that is, to all intents and purposes the same size as one that I have been using without too many problems, and the next size up. The reason for considering the larger frame is simply that the top of the headtube is significantly higher, which would allow me to set the bars higher without the need for a big stack of spacers. I'm hoping that a higher riding position would ease the problems I've been having with numb fingers after a couple of hours. Its a compact style, so the increased seat tube length isn't going to be too critical. The standover height is acceptable. The virtual toptube is longer, but I had thought to offset this by using a shorter stem, which would be about 60mm. Then I noticed that for this size frame the manufacturer is actually advising a stem 120mm long. 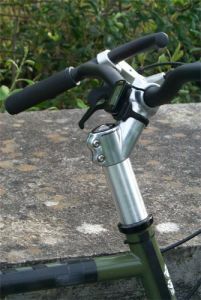 Is using a stem so much shorter likely to have an impact on the quality of the steering? Or are they just assuming that prospective purchasers would want to stretch out and get their heads down? I've been playing around with stem lengths on both my bikes with lengths between 70mm and 110mm with no real difference in handling. I've even read in other posts of people using 'negative' stem length (pointing the stem towards the rider) and cycling quite happily so I don't think it's any big deal so long as your comfortable and your happy with the way it feels. As to frame sizes, I have a 56cm Ridgeback Genesis Day bike with a very quick frame, just a couple of sizes too small for me. When I went hunting for a new bike I got a 58cm Surly frameset that's about the equivalent of a UK 60cm with a 58cm top tube. The extra height on the steerer makes a huge difference to where you can put the bars. Sorry, but I totally disagree and have found stem length to make a lot of difference to the steering. From my experience switching from 120 to 60 is going to make the handling much quicker and far more direct. How about trying a 90 and see what you think? It won't make a lot of difference to how the bike actually handles, but it will feel different until you get used to the differing steering input required. With a zero length stem, you have to turn the bars by moving opposite hands forwards and backwards, but with a long stem you swing the bars from side to side more. I've found that it depends on the geometry and the forks. On a much loved Bianchi Pro I shortened the stem once to avoid neck/shoulder ache, no problems. But when I reversed it to gain a higher position it spoilt the handling. Steering was less linear and in motoring terms switched from understeer to oversteer. Not satisfying and difficult when riding in a bunch. With more forgiving geometry of Specialised Tricross and Trek Pilot I've tried various stem lengths with no ill effects on handling. I make stuff, that's all. ...but the amount you have to move the stem to get the thing to turn... in a wrong way sort of way? Surely the angles are all wrong and nothing good will ever come of it? The further away from the "right" place your stem is, the bigger biceps you need - until eventually you'll look like Kenny Everrett on top of that tank! The only thing that matters, surely, is the relationship between the steering axis and the position of your hands on the bars. How they are linked makes no difference. Ambermile wrote: ...but the amount you have to move the stem to get the thing to turn... in a wrong way sort of way? Surely the angles are all wrong and nothing good will ever come of it? The further away from the "right" place your stem is, the bigger biceps you need - until eventually you'll look like Kenny Everrett on top of that tank! I have a Hurricane Recumbent with "Tilt 'n' Steer" In upright mode the steering is direct, at full speed riding the bars are some 400 mm behind the column, more of a rudder. Nice spacer BTW Ian - definitely the way to go once the washers have been counted! DaveP wrote: Nice spacer BTW Ian - definitely the way to go once the washers have been counted! I machined that from solid bar (FC1 alloy), the swarf probably weighs more than the spacer. You could do one easier if you could find a piece of stainless tube to fit over the steerer, that would just leave the ends to hacksaw and file. It's perfectly do-able, no reason to have a tower of spacers on your stem. Cunobelin wrote: I have a Hurricane Recumbent with "Tilt 'n' Steer" In upright mode the steering is direct, at full speed riding the bars are some 400 mm behind the column, more of a rudder. I vote "depends on the bike (and the rider)". On many it will make little difference to if you lop a few cm off or add a few, for instance on my old tourer I went from 100mm to 50mm and handling was the same. However, the more 'sporty' the bike the more chance that you will be able to feel the difference. For instance, my fast road bike has the handling of a crit' bike - steering is much more hair trigger than my tourer. Changing the stem length made a noticable change to the handling. It didn't ruin the handling, and I soon got used to it, but for those first few rides I could notice it.